the black jeans that have a hidden satin strap that turns them into stirrups when you wear them with boots. I'm over my stirrup pant fear this season. i don't think the silver charm does anything but look cute. these have satin piping and are brown black. Are you all familiar with Radcliffe jeans? I wasn't, but am now. They're $29.99 (reg. $170), they're soft as heck and they're sitting on a rack right in front of the registers on the 6th floor. so i stopped by daffy's last friday and i couldn't find anything except the shoe section (those printed tights you mentioned are long gone). how do you find stuff?! the racks aren't marked by brands... or anything. do you just go and dig for a few hours? Oh yeah I think those jeans look great on you, and the short jacket is nice, and I love the scarf. enc - yes, I blame my older sister who wore stirrup leggings for years. eeps - I think the shoes are on the 5th floor - go to the 6th floor and look for racks marked "designer" by the dressing room. 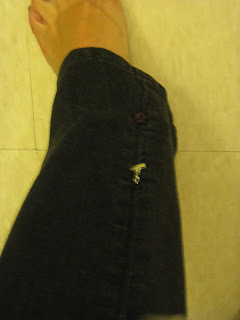 the patrizia pepe & the plenty & these jeans were by the registers. and with Daffy's you do have to do a little exploring and have a little luck. and seeker, the scarf is h&m from a month ago. You are rockin' those skinny jeans! I am jealous, I admit it. I love that scarf too. 29.99! that is a steal! not to mention they fit you like a glove! The radcliffe jeans sound a fabulous bargain!! Stirrup pants are such 80s territory, it reminds me of some navy ski pants I had, LOL!! hey.. 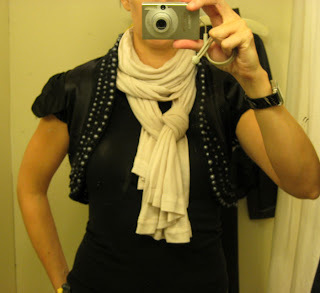 I love that bolero jacket. Those skinny jeans are very well fitted as well. Nice one. I love this outfit! I've gotta have those jeans...any idea if they would have the same sale in europe :)? The short jacket looks gorgeous on you!